A spiritual awakening is not a spontaneous burst of revelation that immediately changes your soul. Your body does not move at the speed of light and requires a period of adjustment in order to handle any type of major change. But, don’t be discouraged. 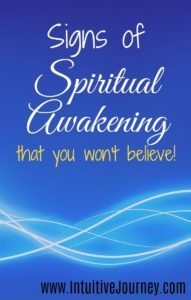 There are signs to let you know that you are experiencing the symptoms of a spiritual awakening and you will make it through the journey just fine. Your scalp may begin to itch and tingle as a new energy is entering your human form. Your crown chakra has opened to receive the divine energy. Moments of heat sensation can suddenly rush through your body. This is a power surge of energy and nothing to fear. If you fear the reaction, it could make you nervous or nauseated. Trust your higher power that everything is going as planned. More uncomfortable physical changes can also happen. Headaches, backaches, digestive problems, flu-like symptoms, and other signs that are not related to an illness can run amuck inside of your body while going through a spiritual awakening. The feeling that you have been living your life all wrong can bring on emotional trauma. You want to right all wrongs, straighten out the world and blame yourself for not seeing the truth sooner. Crying for no reason, having waves of depression, then suddenly feeling joyful are signs that you are trying to handle everything at once. Relax, accept each changing feeling and let it go. Other signs can include a change in eating habits and developing sensitivities to certain foods. Time seems to be speeding up, senses become amplified and you find yourself wanting to break free from structured living for more relevant and important things in life. The sense that you are losing your mind because you are suddenly unlike others is not wrong. In fact, nothing could be so right as to experience the signs of a spiritual awakening and to know and understand the true meaning of life. When to Have a Spiritual House Cleaning?